Do you need a professional, low-cost, detail oriented technician to service your High-Rise Commercial Property? You have found the answer. 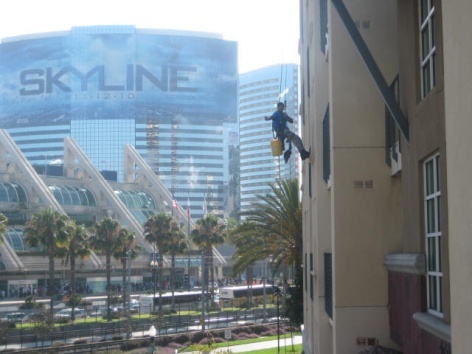 Sky High Windows is leading the industry in Southern California with customized cleaning plans and guaranteed work. With our experienced technicians on your side window cleaning will be a breeze! For our High-Rise clients we employ the use of bosun chairs, hydraulic lifts, and suspended platforms. Our cleaning plans will meet and exceed the OSHA standards and keep safety at the job site our number one concern. We provide professional high quality window cleaning at reasonable prices. Our affordable prices will fit within even the leanest of budgets. Discounts offered to property managers with multiple locations and regularly scheduled maintenance. We can customize a plan to fit your needs and keep your windows spotless. We work with property managers throughout San Diego, Riverside, Los Angeles, and Orange Counties maintaining commercial properties. Our easy scheduling gives our clients the peace of mind that their properties will sparkle. We are licensed, bonded, and fully insured. Certificates are available upon request.